Isaac Newton had it right, but not sure he was talking about holiday decorations. You see, before Thanksgiving I was all excited about the impending decking of the halls. I could not wait!!! 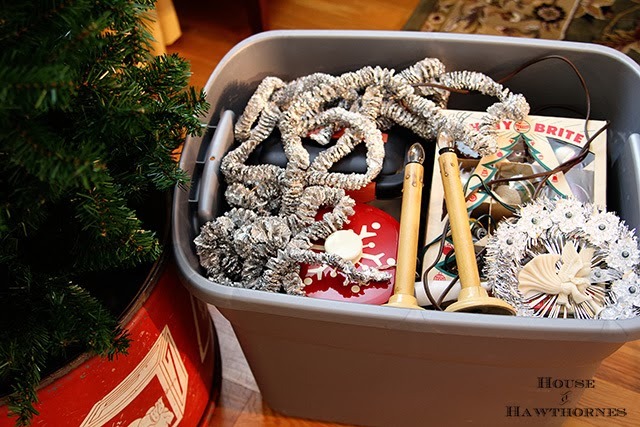 Then after I dragged the boxes out of the crawl space (no spider bites, thanks for asking) and started digging around in them on Friday, I realized that I may not have the time or energy to deck ALL of my halls this year. It seems the calendar is against me. With the way Thanksgiving fell this year, there’s the bare minimum number of days between Thanksgiving and Christmas. We have six less days than we did last year! Who makes these calendars, anyhow? So it seems that whatever I put up now will just need to be torn down and boxed back up in such a short time. Anyone else feeling the weight of the impending pack up on their backs this year? BTW, even though I’m not a part of it (because I would have gone nutso if I would have had to have my house decorated and photographed by TODAY), there is a home tour going on this week that might give you a little decorating mojo. What my plastic tub isn’t inspiring to you? Go on over and check them out. I’m pretty sure you won’t see any plastic tubs in those girls’ homes. Hey, you may have hit on something– this year let’s just open the tubs, take a picture, and be done! I wish!! Pam, you are right about the less time to enjoy the decorations. I’m thinking about leaving my decorations packed up this year and just buying a little tree for the den. Maybe decorating with candy canes and tiny baskets of chocolate kisses …… at least I won’t have a pack up day. I felt the exact same way yesterday as I was pulling out and yanking tubs from behind the furnace. I feel like I just recovered from our Halloween chaos. I’m on board for the tub tour. Sign me up! I totally understand…I only pulled out one tub of garlands and greens, a small tree, and used some ornaments I had in my studio. I decorated around the existing decor. My husband thinks the house feels Christmasy and cozy. Sure was a lot less work! I think the greens are what make everything feel right anyway! We drug all the decorations up from the basement the day after Thanksgiving and they are all out (except for our tree). It does seem like a lot of work and the older I get the more work it is but I love seeing them out even if it is only for a short time. PS – I like that tree topper in your box. I am putting all my things out today, but I keep tossing things back into the bins. I want to mix it up a bit and not use every single thing I own. Which is a good thing because I have SO MUCH it isn’t funny. We leave our decorations up until after New Years, so I still have a month. If I get it done today! (Which I won’t….) Can’t wit to see all your goodies! That must be why we celebrate Thanksgiving in October in Canada! 🙂 The tree won’t see the lights and decorations here this year. We’re flying down to visit Granny & Gramps. I’m missing the decor but not the work. Maybe you should host a ‘Tub Photo’ party! I was in such a panic over the short time between Thanksgiving and Christmas this year, that I started decorating at 7 am on Friday morning and finally finished yesterday afternoon! AND that does not include my trees, one of which is aluminum and the fresh one we cut next weekend. It’s a lot of work, yes, but I spend so much time and money searching for vintage Christmas that it would be an absolute waste for me to not display it. I will probably leave it all up until New Years this year instead of dismantling it on December 26th like I normally do. I agree, who in the heck makes these calendars? Obviously people who don’t have halls to deck. Since I missed Christmas last year because I was in the hospital. I started decorating here back in September. Now it’s all done. hang in there and you will be too. I haven’t thought about the shortened season, but I have decided to do with a bit less holiday decor this year. The Santas are staying in their big old bin, except for my 2 favorites. I hope they don’t escape and haunt my house at night! Happy “less is more” decorating, Pam! At least in Canada we have Thanksgiving in October, that leaves us with some breathing room. The bins can be very daunting, i know how you feel! I feel the same way! I really kept it simple this year – took me all of two hours – instead of a finding and hauling a real tree home, I pulled out a cute but small table top, threw on some lights and a few santa ornaments, wrapped the bottom in burlap and it looks darling. A few small vignettes around the livingroom and kitchen and a candle that smells like a real tree………I am stress free but the house looks cozy and christmasy! Smartest move I have made all year 🙂 Merry Christmas! I am with you–a little stressed. So many tubs got taken down–I am hoping I will get organized and some will find their way to Goodwill! You got further along than my husband and I typically do. It’s just the two of us, and we often travel for Christmas, so we usually don’t bother putting up much of anything, just because it’s so much work to put it up in the first place, and to take it down just ~30 days later just wears me out even thinking about it. So, we typically get our Christmas “fix” by watching Christmas-y movies.